We have yet to discover a medium that can rival the power of music. It can move the human spirit, heal a broken heart, and even amplify a joyous occasion. From a more pragmatic standpoint, music is also a multi-billion dollar industry that spans the entire globe. It is not enough to possess a talent for this craft. Any artist must have an eye for business, marketing and promotion opportunities. In today’s multimedia environment, those opportunities can be found online. Gone are the days of passing out mixtapes or asking small-time magazines to publish your articles. For all its flaws, the web offers you an enormous advantage: a direct connection to your fans. Considering the importance of online promotion, your website must be flawless. However, few people can claim to possess both musical talent, and a knack for online development. HTML templates give you the power to create amazing websites, yet they maintain a user-friendly, accessible interface. Thanks to these wonderful templates, the playing field is levelled. Divi is an outstandingly amazing and easy to use tool which you can effortlessly employ as a music website template. The versatility and high adaptability of the site canvas helps you alter it to your exact needs in a snap. 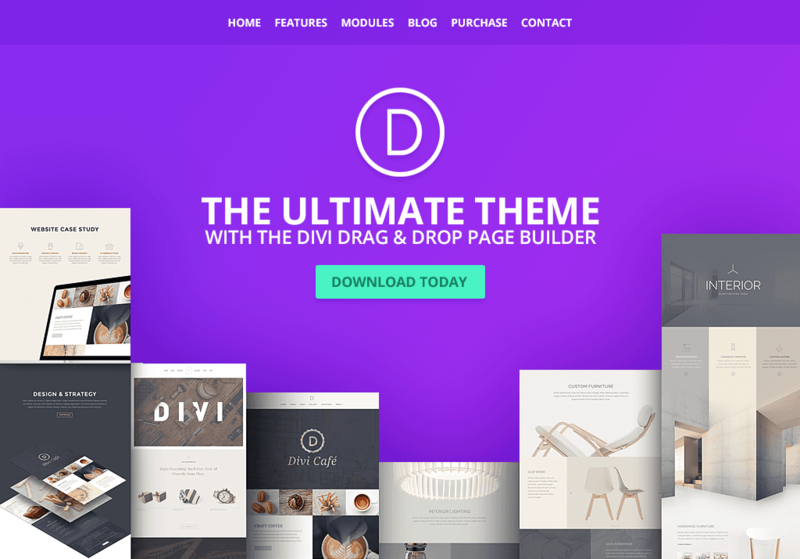 Out of the box, Divi comes with a horde of layouts and features that will do you well. Of course, you can also adjust and improve the web design however you see it fit your needs best. Bear in mind, there is no need to know how to code to be able to work with Divi. What’s super cool about the almighty Divi is the fact that you can test the waters for free. You can play around with different features and functions and truly understand the power this layout has. There are no limits when working with Divi. 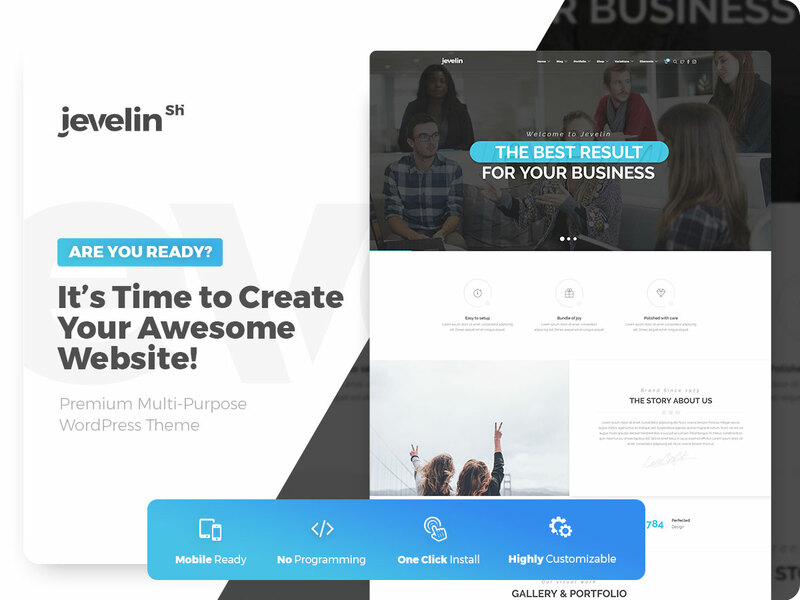 Jevelin is a multi-purpose tool that gives you all the needed for your web space and then some. Regardless of your project and niche, Jevelin has no problem altering to it. Even with the demos alone, you can hammer out countless entirely different websites including for musical projects. That said, whether you are an artist, a band, run a radio station or would like to start a musical blog, whatever the case, with Jevelin you can realize it quickly and efficiently. With one single click, you can install the template and start using it right away. Thanks to the convenient Elementor editor, you also do not need to know how to code and design to create real masterpieces. With Jevelin, everyone becomes a pro at web development no matter your prior experience. Get your musical project rocking with Jevelin. Uncode is an outstandingly amazing, creative and sophisticated music website template which you can employ for an array of different intentions. After all, with Uncode‘s multi-concept approach, you can start your thing in little to no time. First thing’s first, pick the right demo and go from there. You can even use the sample exactly as is and stuff it with your custom content. However, the process of editing and improving Uncode’s default settings is so simple, we highly advise you to take the plunge and fine-tune it. All it takes is some dragging and dropping and you are ready to go. Other goodies and features of Uncode are mobile-readiness, cross-browser compatibility, SEO-friendliness and speed optimization. It is a guarantee that your final product will work like a dream across all devices and platforms. 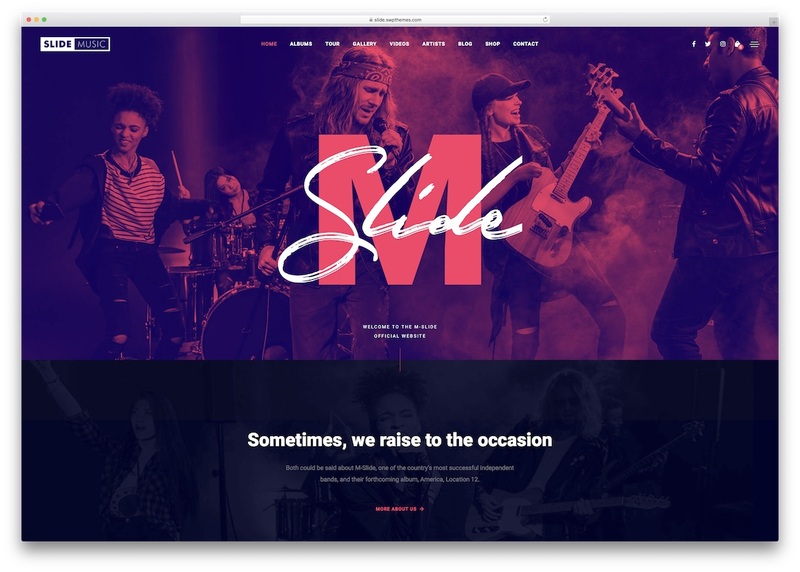 Following all the latest and greatest in the online space, Slide is a spectacular and easy to use music website template. Slide has a ton of content at your service to speed up the process of establishing your dream website. Artists, bands, DJs, radio stations, record labels, you name it, with Slide, you can craft a website for each and like a hundred more. Seriously, once you start working with the incredible Slide, you have no boundaries. In fact, your imagination is the only barrier there is. 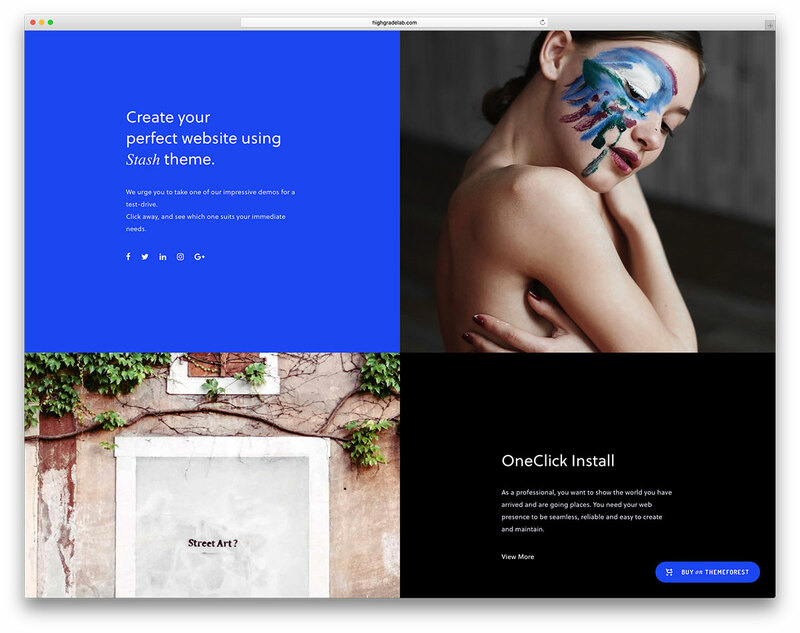 Slide comes with multiple demos, light and dark looks, WPBakery drag and drop page builder, flexible and adjustable music player and two cracking events layouts. The list of treats continues with subscription form, Slider Revolution, WooCommerce compatibility, changeable backgrounds and translation ready to name a few. You better take a peek at Slide now and make a difference. If you would truly like to differentiate yourself from the masses, you better consider using Kentha. This contemporary, impressive and outstanding music website template is full of amazingness that will put you right on top. Not only does Kentha have a ton of ready-to-use demos, but there are also numerous features, extension and plugins that you can take to your advantage. 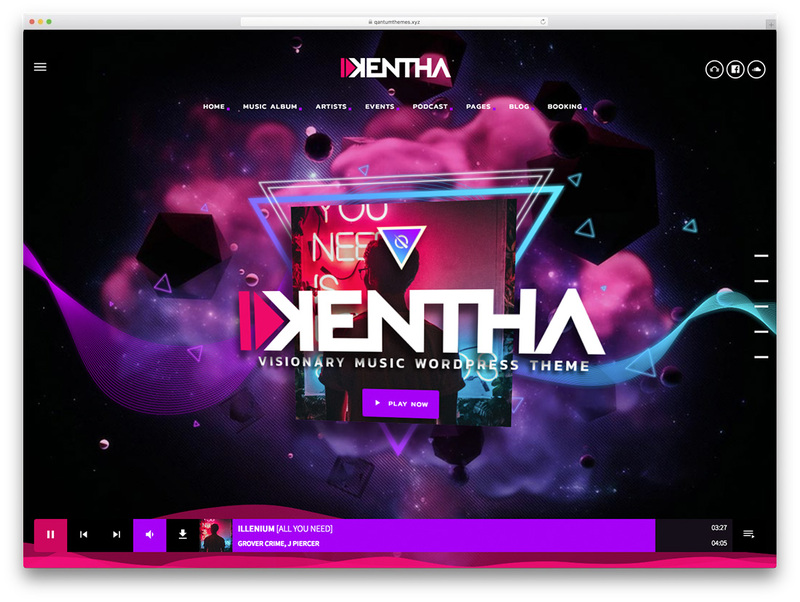 No matter what your musical project is all about, with Kentha, you can bring into being the exact website for it that you need. And the entire process of launching your fresh page is way more straightforward than you think. In brief, Kentha has it all ready and set for you to use, adjust and improve. 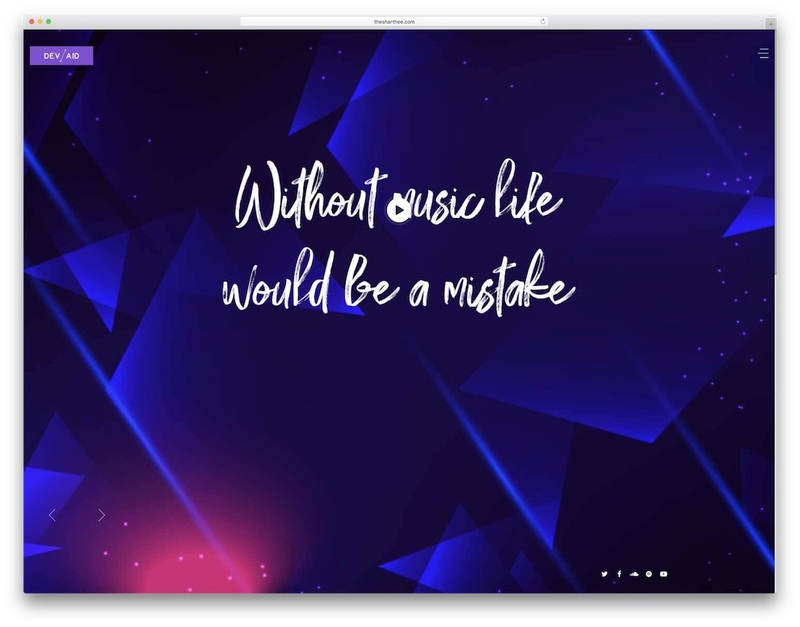 Music visualizer, full-screen video backgrounds, three neat menus, custom player, events, gigs, podcasts and live sets, the list of things that you gain access too is vast. Just go with the Kentha flow and stand out a mile. 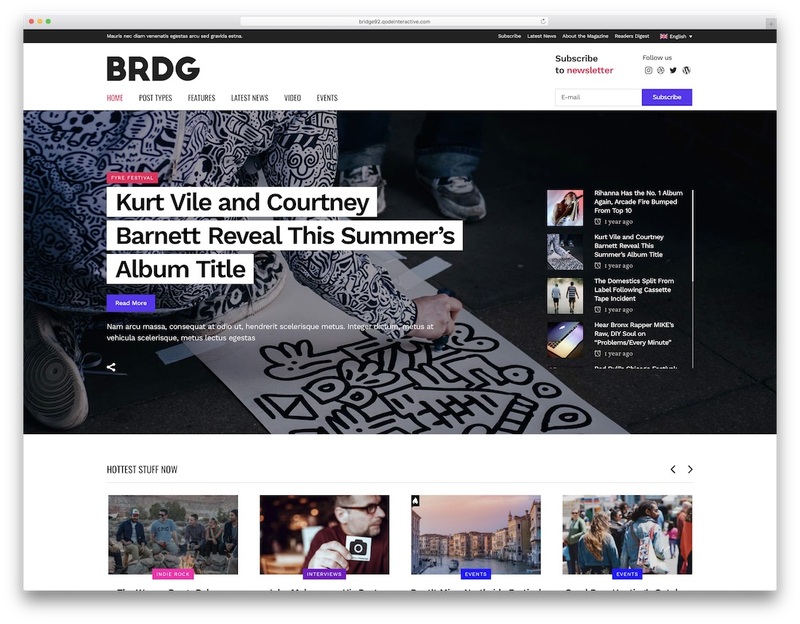 With a collection of close to four hundred demos, you know that you can craft literally any website you want with Bridge. If you are looking to build a music page, go all in with Bridge and construct one swiftly. There are multiple dedicated layouts to choose from, but the process of establishing your web space does not need to end here. Sure, you can utilize the sample you dig the most out of the box, but enhancing it with your signature style is a lot of fun. Indeed, you need to have no programming background to make it happen what turns out to be super exciting. Some of the features of Bridge are social media integration, one click demo data import, smooth animations and a powerful admin panel. The layout is also mobile-ready, retina-friendly, speed and SEO optimized, as well as auto updated. 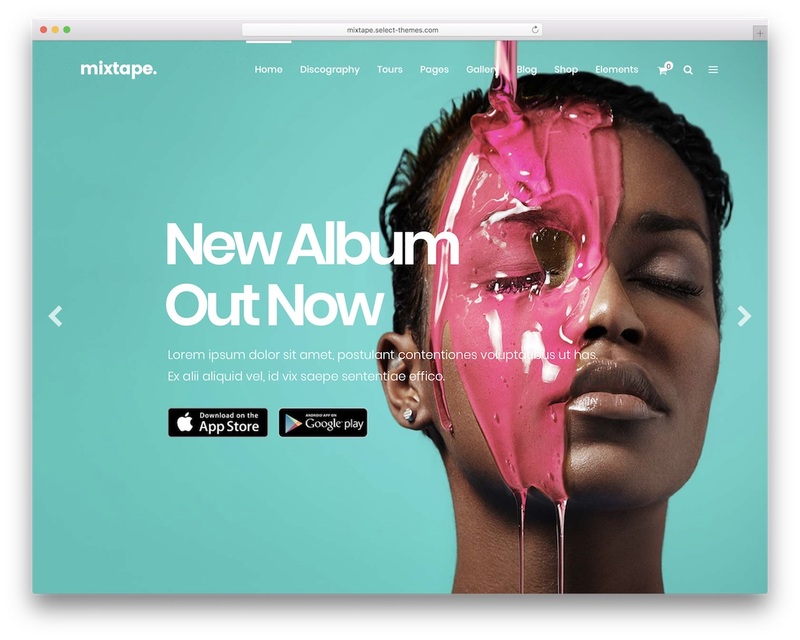 As the name suggests, Mixtape is an ideal musical website template for artists, bands, DJs, festivals and other related projects. You can get your thing going speedily by choosing the right demo for your cause. With its modern web design, you can capture everyone’s attention and start growing your fanbase to new heights. Mixtape includes loads of convenient features and components that will help you complete building your online presence without the sweat. 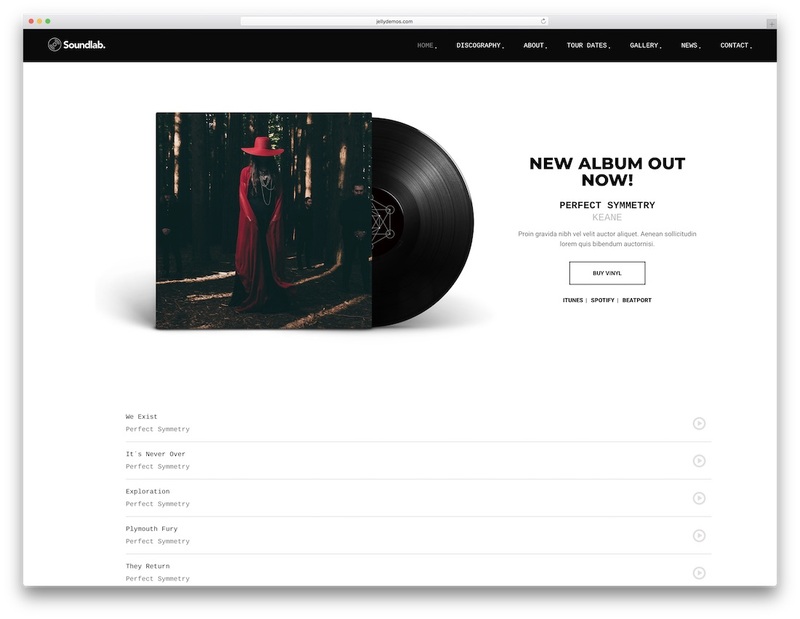 Speaking of features, Mixtape delivers album pages, tour date layout, blog, shop, a ton of custom shortcodes and drag and drop technology. No need to be a tech wizard to be able to work with Mixtape and successfully launch a musical website – the process is rapid and straightforward. All there is left for you to do is to head over to the live preview page and let Mixtape blow you away. Stash is a complete, modern and clean WordPress theme. It is useful for many different businesses: marketing, finance, art, technology… and even furniture, Stash suit all them. Its features are incredible: unlimited design and panel options. 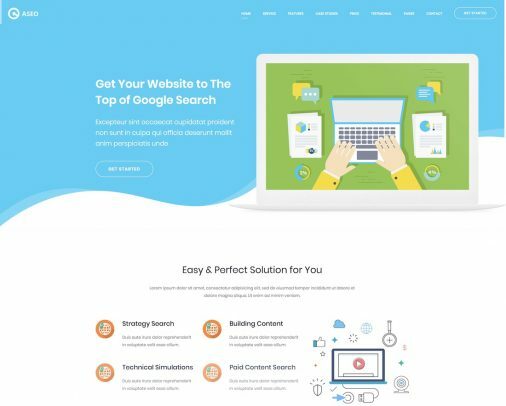 260 pages builder blocks, 48 homepages and more than 80-page elements. It offers you 7 pre-built portfolio pages and 15 inner pages. They translate into possibilities of customization, and unique sites. These possibilities go bigger for visual aspects. Stash gives you Font Awesome icons integration, and +800 Google fonts typography. Lastly, the Slider Revolution and Essential Grid plugin to the mix and you get something truly powerful. Stash is highly responsive because it is built especially for mobiles first. This theme guarantees to display properly on all major devices. Even if it is image sliders, portfolio grids or contact forms. Also, cross-browser compatibility and SEO-ready assure a good place in web visualization. It is ready to sell with WooCommerce and multilingual translation support. But, despite its advanced features, it is easy to use. When you choose Stash, you are getting world-class support and lifetime update. Aside from the drag-and-drop codeless block builder. Have a look at its easy to install demos! Try them in just one click! It also offers wide documentation, and a child theme! Try Stash! Adonis is a music website template of your choice if you want to access to dozens of unique assets and layouts. It is a tool that provides a professional, clean and contemporary look to websites whose main focus is concerning music and everything related to it. There is quite a considerable amount of content and traits that you get what makes Adonis a banging item for crafting your ideal web space. On top of that, you can edit and customize it, too, and make it follow your branding. There are six different demos available, dark and light layouts, various players and even an off-canvas music audio player. Adonis is capable of playing music simultaneously while avoiding interruptions on browsing pages. It is based on Bootstrap Framework what gives it the needed flexibility and mobile-readiness. Adonis contains full documentation as well to never find yourself going around in circles. 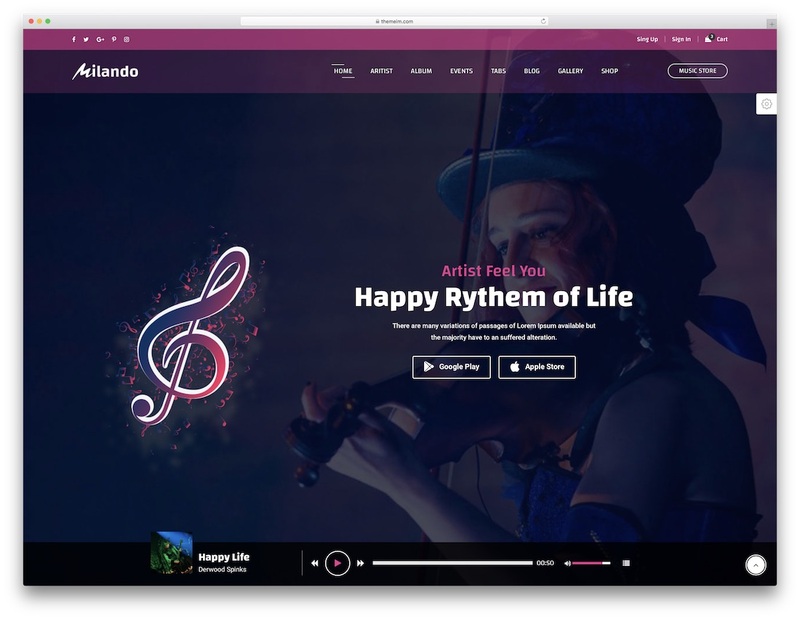 Milando is a powerful and advanced music website template with three different home variations and an additional online magazine style. Pick what suits you best and start enhancing Milando with your content and details and you are ready to roll. While going with the out of the box look is the fastest approach to site creation, you can still take one extra step and adjust and modify the look of Milando at free will. You can also come back later on and freshen up your web space according to your current state. You are looking at a mobile and retina-ready template, optimized for smooth cross-browser performance to make sure all your fans are treated right. Offer them to listen to your music straight from your page using the integrated music player and push your forthcoming tour. Sell concert tickets, showcase music video, start a blog and market your merch using the online shop pages. 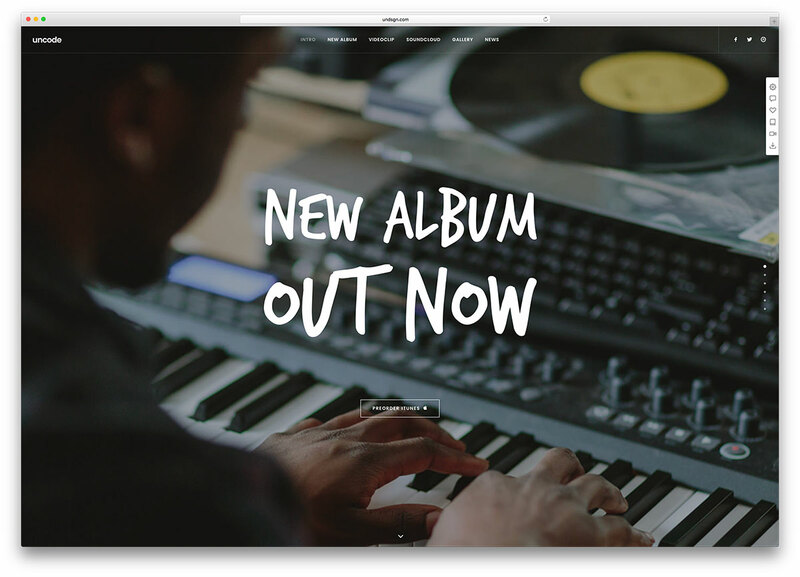 If you are looking to try a modern and sleek music website template, Mousiqua is a must for you. Look no further and get a taste of what is possible with this fashionable masterpiece and possibly use it as your online presence’s foundation. This template is popular among musicians, bands and artist of different genres, as well as amateur enthusiasts. Mousiqua has a comfortable one-page layout where you get enough space to cover all and everything about yourself and your work. 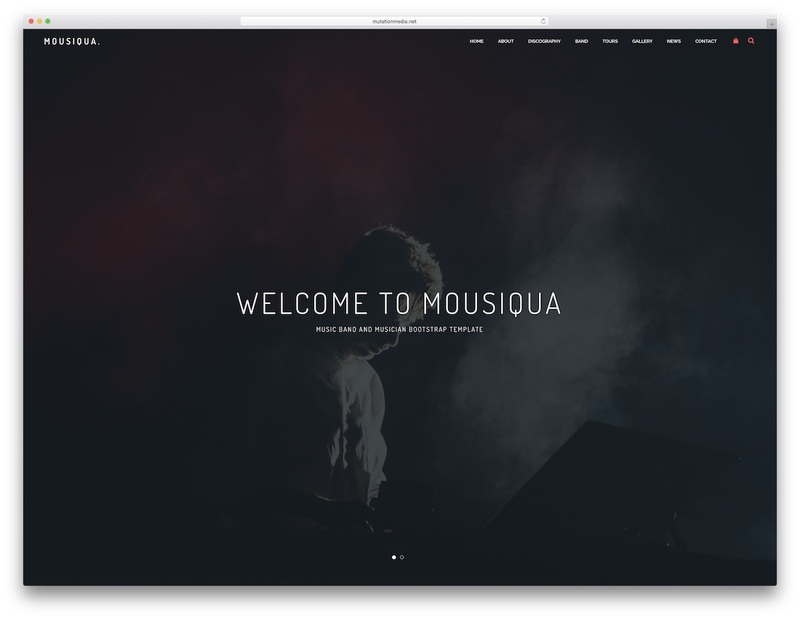 Mousiqua allows you to introduce yourself to the online community with ease and simplicity. In this day and age, a website should not be missed even for someone passionate about tunes and music like yourself. It is a fantastic marketing tool to spread your name and get known. Some of the Mousiqua features are social media feeds, sticky navigation, super single album page, music player and countdown timer. Mousiqua’s dark layout will give everyone a taste of professionalism and elegance. Deus is something slightly different compared to what you are expecting to see in a music website template. It is a multi-niche newspaper web design with various different demos including one dedicated entirely to the music industry. If you like to keep yourself up to date with the latest trends, tunes, album releases and other whatnots, do consider starting your own platform full of enticing content. And with Deus, building your platform is easier than you think. The template is powered by the latest technologies and follows all the up-to-the-minute regulations. It is mobile-ready, in tune with modern web browsers and wholly refined to ensure the best user experience. 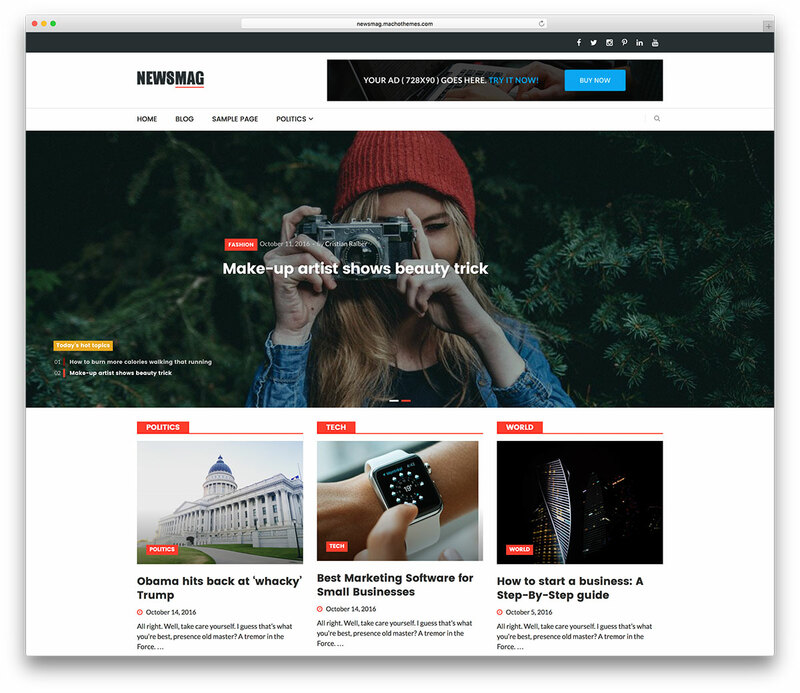 Reusable components, loads of widgets, multi-level drop-down menu and newsletter subscription are a few of the specialties of this imposing music-first news pages building tool. Compose an everlasting piece through your website. With BeatsWave, you will never be skipping a beat. This music website template is perfect for artists, labels and everyone in the recording or radio industry. You can easily and swiftly alter the tool to your exact style and customize it accordingly. 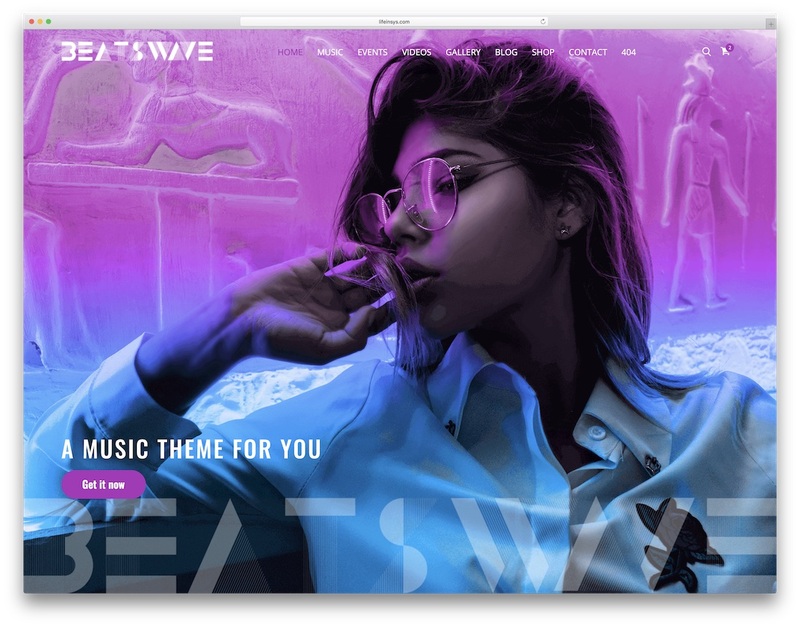 Out of the box, BeatsWave comes with an astonishing collection of eighty HTML pages which consist of four outstanding homes and multiple internal sections. All templates are precisely crafted by creatives, for creatives. There are so many features that any music lover would relish. Along with the audios, you can also embed videos and other custom content that will differentiate you from the masses. Meanwhile, you can update your listeners with your upcoming events with the event feature and even sell tickets and merchandise. In conclusion, Beatswave is definitely worth every dollar spent. Music websites are almost indistinguishable, and you do not want your site to be just like that. Be a frontrunner by getting the Devaid template for your incomparable concepts. 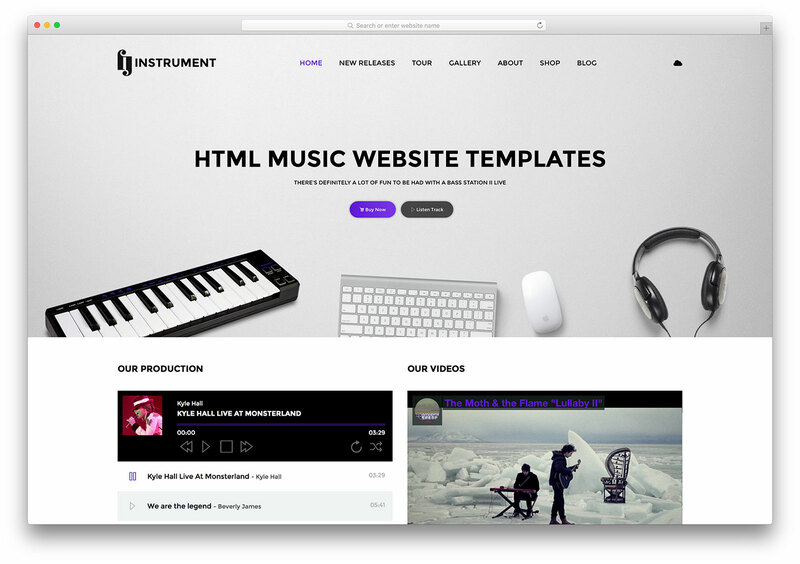 This music website template lets you experience high-quality design possibilities with its flexible and responsive templates and features. There is a huge collection of home page and inner page layouts which you can play around with until you find the best combination. Devaid has bountiful features that let you manage audio, promote albums, organize radio stations and so forth. In the kit, you will find six demos for online album stores, artist pages and other spectacular music projects. Besides, you can also tweak the default look of Devaid to your likings without hassle. Devaid also makes sure that your page works seamlessly on all devices and browsers, as well as delivers great browsing and listening experience. The music industry is highly competitive, so it is only strategic to be unique with your ideas to attract listeners and convert them into fans 100% of the time. Bepop, a music website template, is the most relevant, trendy and creative web design for artists, bands, record labels and the like. 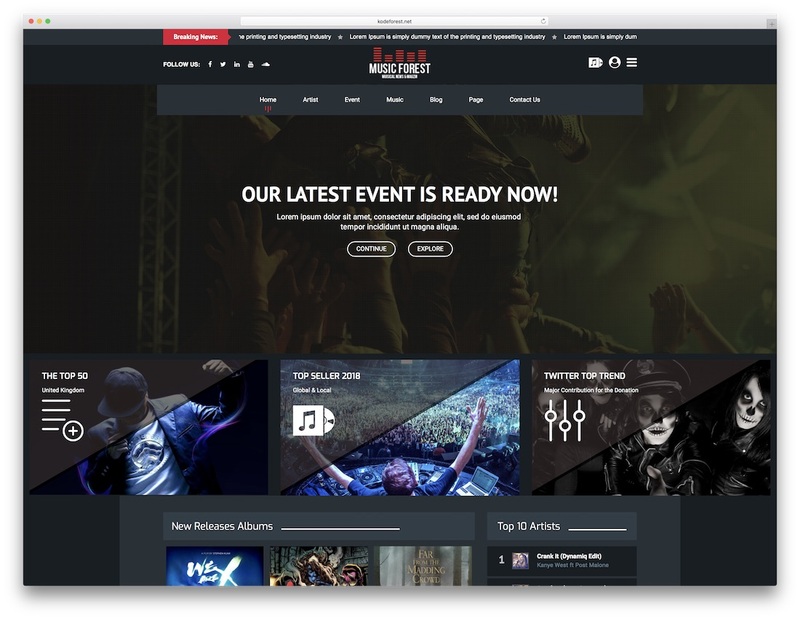 With its impressive collection of ready-made material, you can create a quick and easy website design to promote your albums and gigs with an extraordinary and engaging vibe. 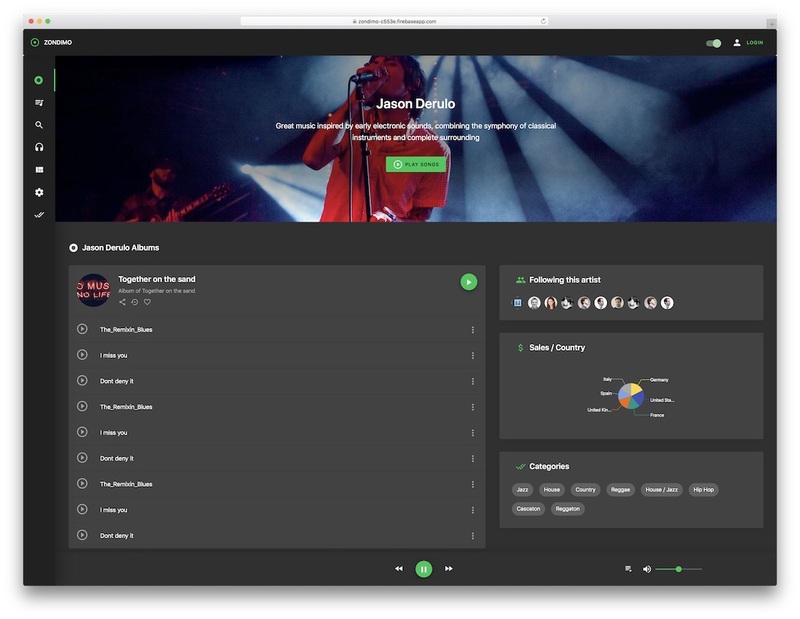 Bepop has an extensive non-stop player which keeps your listeners immersed within your world. 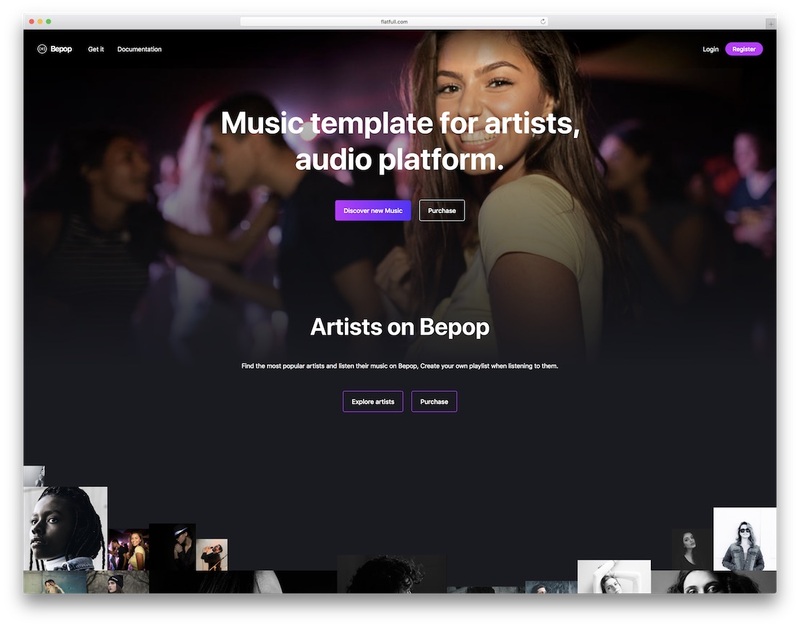 With Bepop, you can create landing pages, plug budding artists with discover page, update top charts, feature popular musicians and even start a musical blog. The options and possibilities are there; you only need to get your hands on Bepop and see the magic happen. 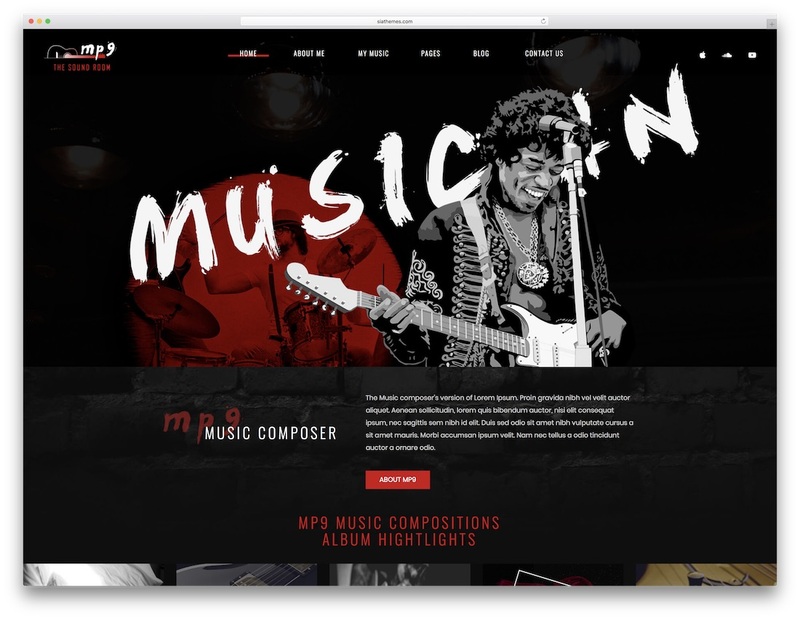 If you are a musician, composers, event organizer or simply a music aficionado, MP9 is one of the best music website templates out there. Due to its functionality and ease of use, MP9 comes very handy for beginners and approved by pros as well. MP9 is responsive and compatible with various website platforms and different devices. Since you can easily adjust the template to fit a particular purpose, MP9 users may utilize it for a broad range of different intentions. In the bundle, you unlock many practical features and assets that will fire you up to get your musical project online and attract new fans and grow your base. Some of the goodies are CSS3 animations, parallax effect, blog, newsletter form, and even a coming soon page. You see, MP9 has it all at the tip of your fingers, all you need to do is to employ what’s available and rock the online world with it. With something fresh, refined and optimized like Irish, you are assured your end product will be a cutting-edge website. 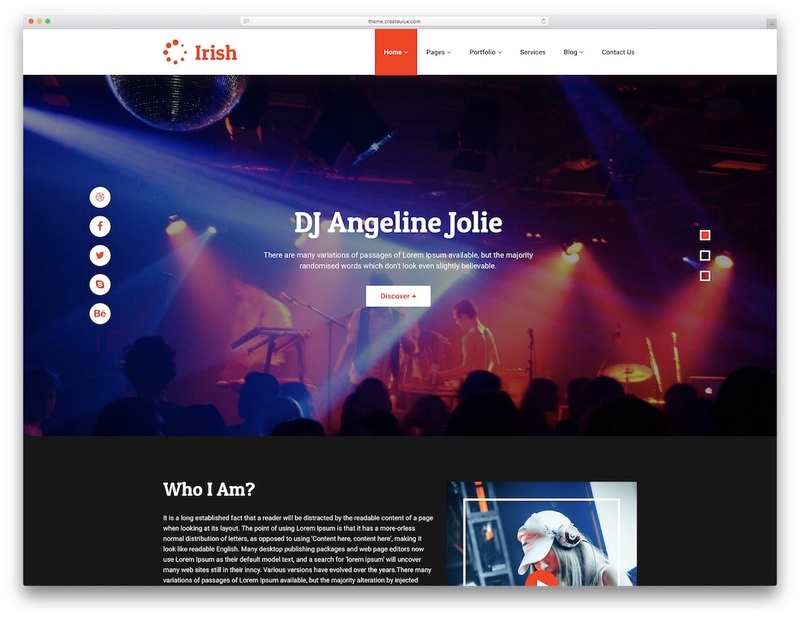 While Irish is an enticing multi-purpose tool, it is also safe to say that it is a music website template as well. Due to its versatility and high adaptability, you can use Irish for all sorts of different ideas and plans. After all, it has a total of thirty HTML files of which eighteen are impressive index pages. In the package, you get two styles that are perfect for a variety of music projects. Out of the box, one is for DJs and the other one for music events but the power of Irish allows you to use it for almost any type of musical-first page. Irish is responsive, retina-ready, perfectly in tune with all major web browsers and easy to adjust and improve any section. 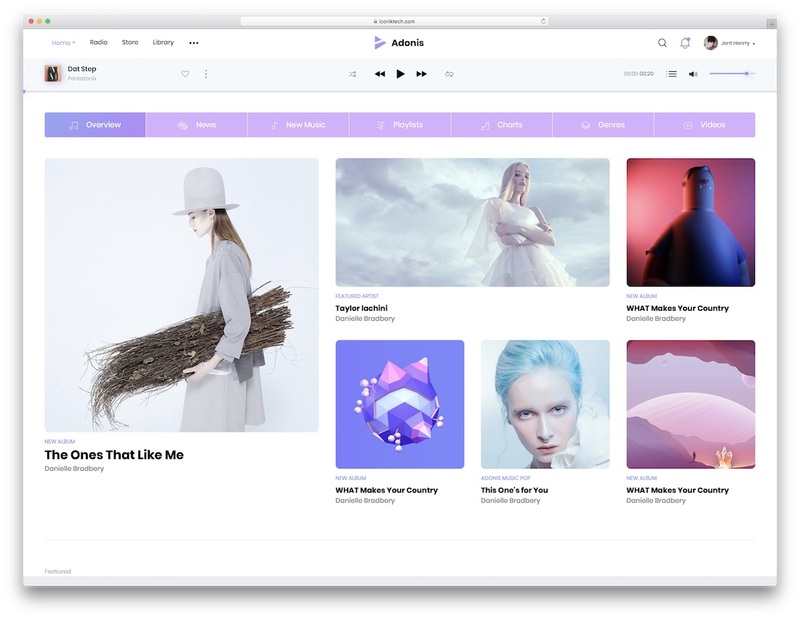 For something one-of-a-kind and outstanding, Alea is a music website template that you may use as an app website template for music streaming or store. Alea employs the latest technologies that incorporate modern trends on the web. Due to its secure and awe-inspiring online appearance, Alea gives all its users something remarkable to work with. You can later also expand the tool and turn it into a real application if there is a need for that. Its finest quality and top-notch standards make Alea a standout in the niche of music-focused site canvases. 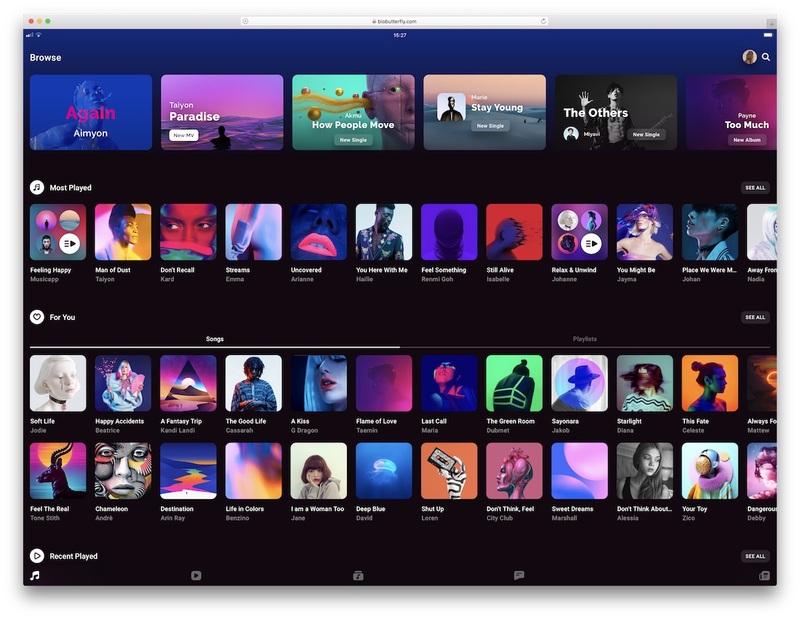 With numerous included features and assets, you can quickly create your very own music streaming app without having years of experience. Utilize what comes with the Alea bundle and enjoy the journey. Besides, customer support is also part of the deal, as well as documentation. You will need to execute very little action on your end to have an active page up and running with MusicForest. It is a modern and manageable music website template for artists, singers, musicians and all the rest that’s in the entertainment industry. If you need a website where you can push your work and spread yourself among the global audience, it is necessary for you to own a page. You can easily market yourself however you fancy and have your entire web presence under total control. MusicForest has more than 35 HTML layouts, an option to choose between dark and light looks and a fully responsive web design. From the trendy first page to practical internal sections, it is all there, ready for you to make good use of. You can also start a blog, sell items using the integrated online shop section and offer everyone to get in touch with you utilizing the working contact form. Not to mention, link all your social accounts with your page and advertise those, too. 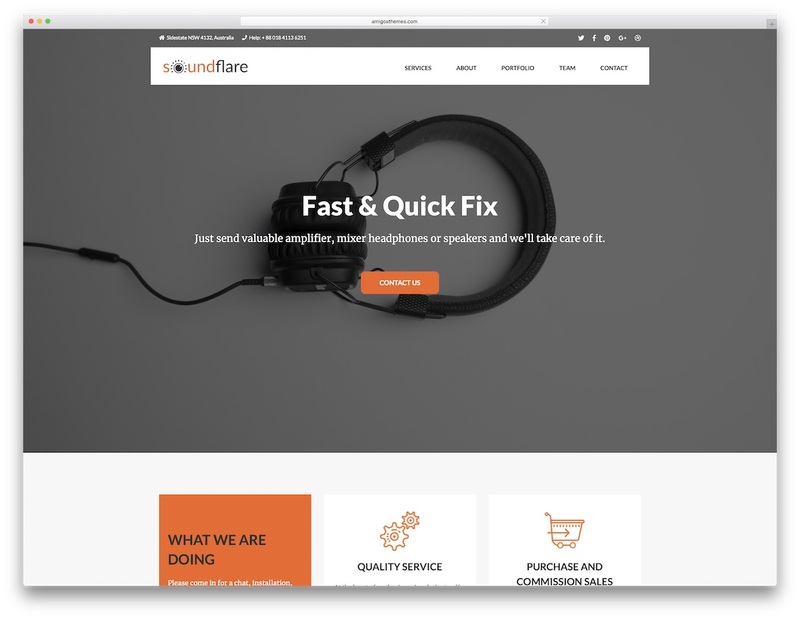 SoundFlare is a special music website template that is perfect for Hi-Fi and audio repair services. While the majority of site skins are for artists, bands, events and such, this one is slightly different. However, repair services in the music industry are highly sought so make sure you reach those in need with your refreshing internet presence. And it is SoundFlare that will help you expand your brand and start helping even more folks with their instruments and Hi-Fi equipment. The template offers a minimalistic look which makes it appealing to broad audiences as well as its service owners. With its extremely pliable and modifiable design and layout, changes to fit your need or push the services are established with ease. SoundFlare includes a full-width slider with text and call-to-action buttons, sticky navigation and attractive hover effects. It is also stuffed with a ton of other different useful elements to create a web experience of a kind. 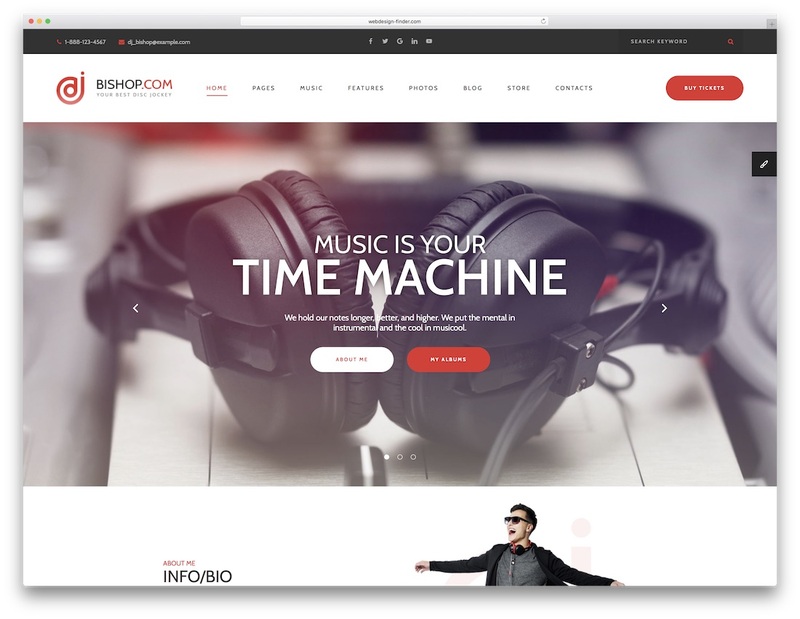 Hence the name, Dj Bishop is a music website template great for DJs, as well as musicians and performers. Basically, everyone who is producing tunes for the folks to enjoy, you can craft a page with Dj Bishop. That said, the tool is fully adjustable, easy to use and quickly adapts to your needs and regulation. All thanks to its flexible, clean and tidy web design which you can use exactly as is or further tweak it to suit your brand to the very last detail. Different homes, a ton of inner layouts, boxed and wide, dark and light, three preset color schemes, you see, Dj Bishop is a serious deal. 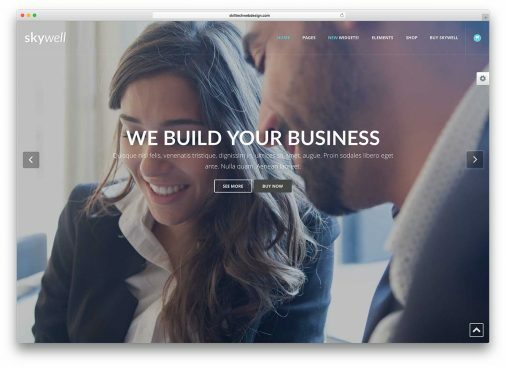 It also comes with a visual page builder what gives you a chance to create your custom looks without undergoing any complex tasks and fancy moves. Besides, there are several presentational videos available to assist you on your site establishment with Dj Bishop. Singer is one of the newest and brightest music website templates that brings edgy, trendy and original design. The template is more than ideal to use for artists, musicians, composers and other creative minds in the music business. Also, there is no set ruling for what niche you can use Singer – it works with all genres! Singer provides a one-of-a-kind environment wherein your music and talents are placed right in front of your fans. Hence, making your web presence more known online. With Singer, you get all the essential features and assets that you ask for to have a successful music page. 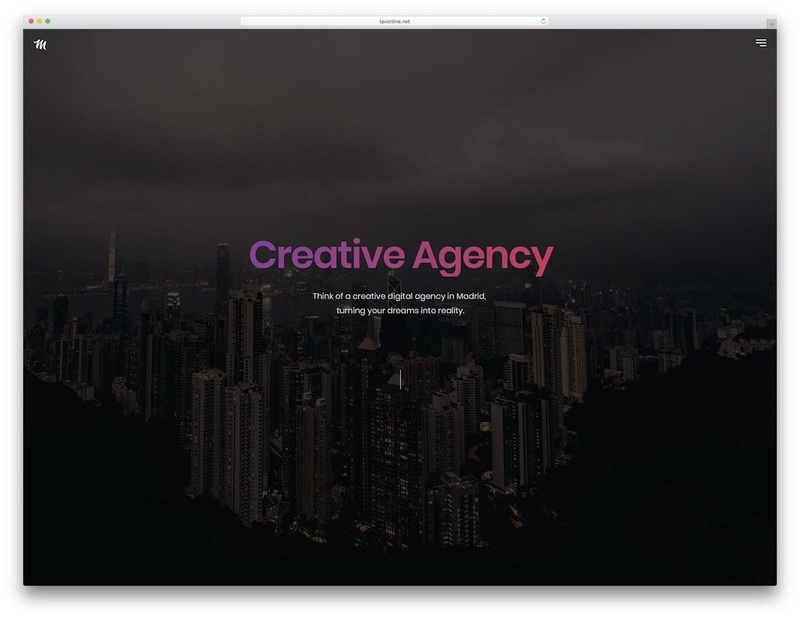 Loads of HTML pages, a mass of shortcodes, dark and light looks, as well as boxed and full-width options, the assets are endless. Singer is compatible with MailChimp, includes parallax sections, comes with PSD files and has an organized and tidy code. In our true fashion, we try and keep things as versatile as possible. Above and below, you can find all sorts of different music website templates, including Madrid. This might not be a musical-related tool out of the box, but if you run an agency inside the industry, you will find Madrid of great use. With the dark layout, it rocks, you will deliver the best possible experience to your potential clients willing to work with you when it comes to promotion and marketing. 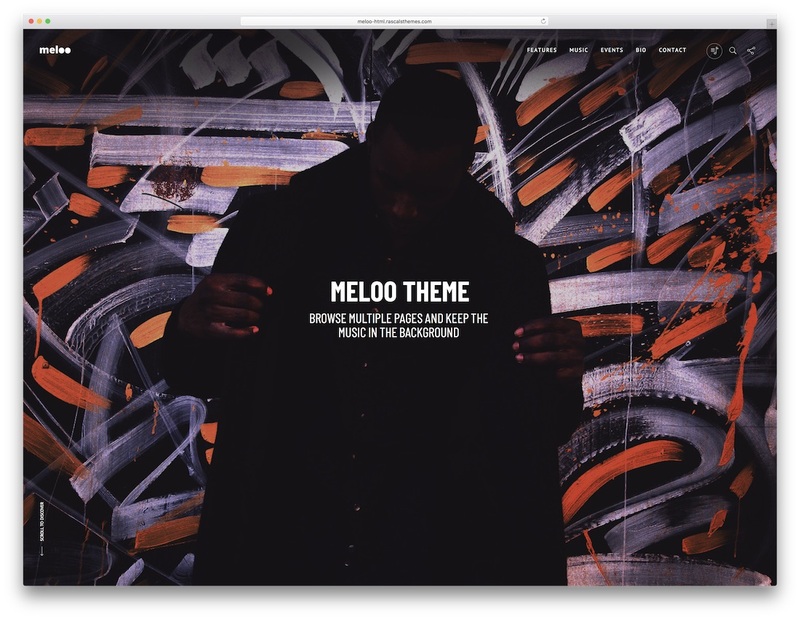 Meloo is a top of the line music website template that offers an assortment of elements and features intended for an increase of aesthetic appeal. With those, you are also about to craft a fantastic online presence, top-notch navigability and enjoy excellent customizability. Meloo comes with two main demos of dark and light versions, but you can expect other styles to drop with future template updates. Some of the key characteristics of Meloo are event integration, continuous music playback, Scamp music player and fully integrated with SoundCloud. When you download Meloo, you gain access to numerous other features that will do your musical project and your internet presence exceptionally well. 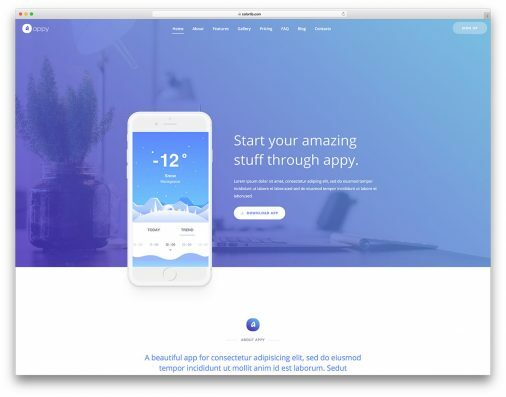 Parallax effect, countdown timer, sticky navigation, filterable portfolio and animated statistics are other goodies Meloo has in store for you. Get your thing to shine online, attract new fans and grow to a new degree. If you are after building your very own music app, there is no need to hire a developer to do it for you. With the smallest experience in building websites and whatnot, you can have your very own application all set up thanks to Zondimo. This music website template uses Angular2 and Material Design, as well as all the latest and greatest web practices. In shorts, with Zondimo, you are guaranteed an always stable experience for a blooming fresh application. Zondimo supplies user’s playlists, albums, profile pages, login pages, dark and light looks and a nifty home page design. With such a powerful tool, there is no need to keep postponing the creation of your dream music app. Get things rocking now, download Zondimo and start forming what was once only a fantasy. If you have the intention to rock the music scene, then you should positively try TheCrowd. It is a special music website template primarily aimed for rock and cover bands who want to communicate their music and scale their fan base online professionally. However, since TheCrowd is adaptable and customizable, you can also use it for other musical projects you are working on. No need to feel limited at all once you have so much content at the tip of your fingers. TheCrowd comes with two distinct styles for your convenience; a one- and a multi-page variation. Other treats are dark and light skins, visual page builder, CSS3 animations and a broad specter of predefined shortcodes to benefit from. 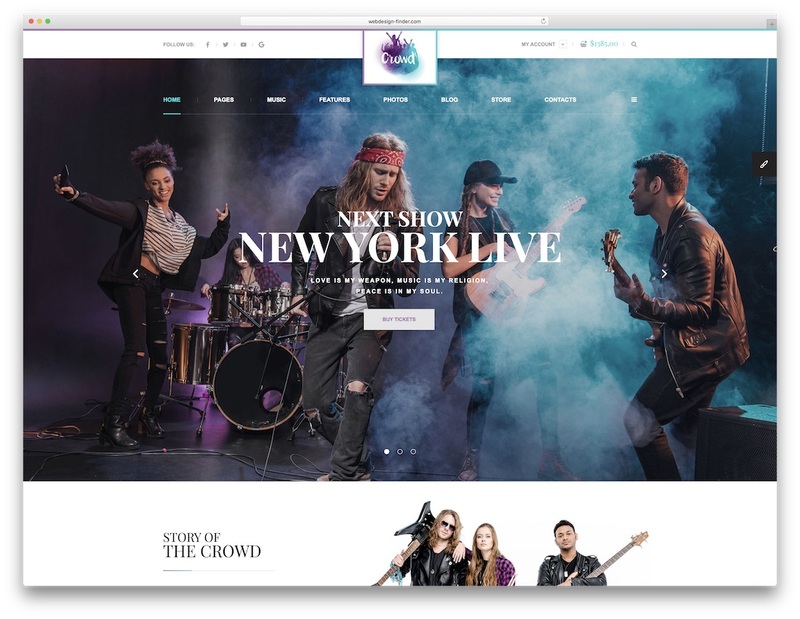 If you want to construct a gorgeous and killer website for you music inclination or even business, you should definitely give TheCrowd a go. Every band and musician out there should have a website. Sure, social media profiles might work best for you at the moment but to always feel safe and secure, a page is something that will always work and push your works. To forge one, you do not need to spend a whole lot of time working on it. In fact, with Soundlab music website template, you can craft a space for yourself on the internet quickly and efficiently. Building websites is not rocket science anymore. Soundlab has six one- and four multi-page demos included in the kit, as well as a blog and a coming soon page. Other assets of the tool are an audio player, music album, browser and device compatibility and retina readiness. Soundlab also works smoothly with all major players, like SoundCloud, Spotify and YouTube. Let them enjoy your tunes at all times straight from your website and have your loyal following growing steadily. Good evening! I wanted to know if I buy a theme, it would be mine or I would buy only one to liseça to use until a certain time. I’m from Brazil I do not understand much English and wanted to know the actual price of the issue. Rockit 2.0 entesei me for this topic. Nice Post about music website templates with a proper guide. Best Templates ever! Thanks for sharing the wonderful HTML based templates.